Dave Newell co-authored this article. It was published in the January, 2000 CORSA Communique and updated in July, 2009. This rare Antwerp-assembled '66 Corsa coupe is now owned by Eric Boughner of Clay Township, MI. (Only 48 Corsa coupes were assembled in Belgium that year.) Previously, Sam Christ owned the car, having purchased it in New Jersey from Tim Schwartz. Tim bought the car from Frank Cerny, a neighbor of his. 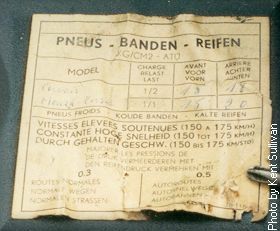 Frank purchased the car in Belgium in approximately 1972, while working in Belgium. He liked the car well enough to have it shipped back to the U.S. after he finished his work assignment. 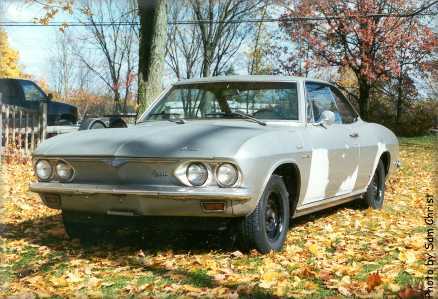 Sam compared the car to the list of options with which Kent and Dave thought the car would have been configured from the factory, according to the '66 Canadian Corvair production report. Items in green below support our deductions; items in yellow don't help or hurt. The front turn signal lenses were originally clear instead of amber. The lenses currently in the car (and shown here) are amber. The clear lenses were not in the car when Sam bought it; they were loose pieces that Tim handed him. The clear lenses have GUIDE 10 SAE DP 65 along the bottom edge. 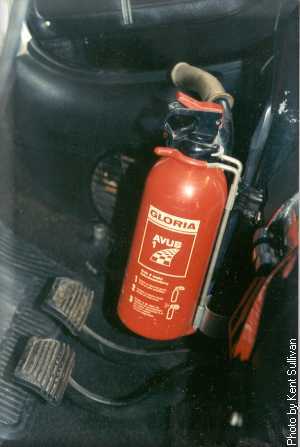 A fire extinguisher is mounted to the steering column. Frank confirmed that the clear lenses were installed in the car when he purchased it but that he had to replace them with amber lenses when he took the car to Paris. Dave related that the use of clear lenses on '63 - '69 Corvairs assembled and sold in Europe (& possibly elsewhere) is well-documented in GM records. 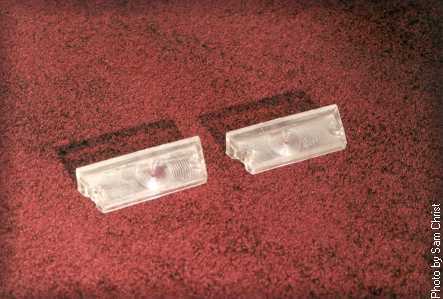 Ronnie Stensson, a Corvair owner in Sweden, and Guus de Haan, a Corvair owner in The Netherlands, provided additional information regarding clear turn signal lenses. Frank also confirmed that the fire extinguisher was in the car when he purchased it. 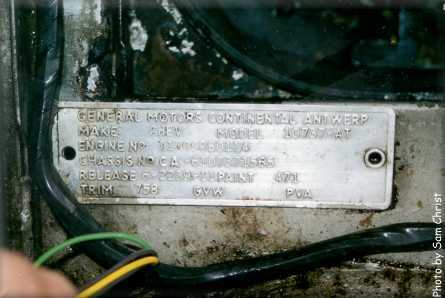 According to Frank, having a fire extinguisher (as well as a medical kit and a reflective warning triangle, as Markus later pointed out) was required by law in Belgium but these items were not provided by GM. Dave said that "for all we know, the extinguisher, triangle and maybe other items were provided through the government licensing agency or the local dealer." Tim still has the reflective triangle and provided some information about it. Also quite intriguing is the tri-lingual tire pressure chart affixed to the inside of the glovebox door. Kent fortunately was able to get a translation of it from a friend. 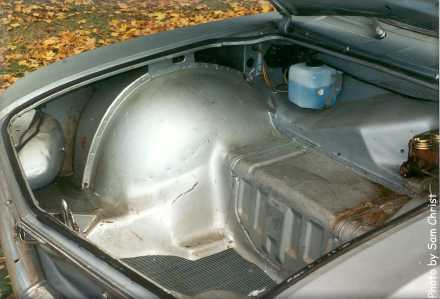 The trunk interior color is consistent with Canadian-produced cars—it is painted body color. The glass (except for the windshield and right door glass, which have been replaced) is stamped "DCL", indicating the standard supplier for Oshawa-built late Corvairs. 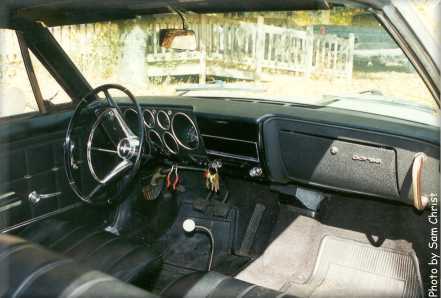 Tim mentioned that, at the time he purchased the car, it had inside window cranks with silver knobs instead of black. 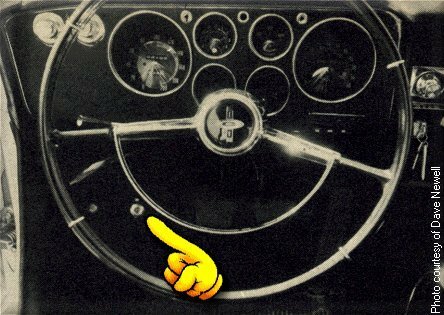 (Sam verified that the car still has these knobs.) Dave commented, "The chrome knobs aren't surprising, since they were used on Impalas, which were also built in Belgium and Switzerland. It would be simpler to use just one knob on everything." Sam brought this car to the 1999 CORSA International Convention at Lake Tahoe and offered it for sale. Kent was able to get pictures of the unique glove box door tag and fire extinguisher (see photos). The VIN is stamped into the left side frame rail of the engine compartment (not pictured). It is also repeated on the body tag. There appears to not be a separate body number, unlike cars assembled in the U.S. and Canada. Concerning the early history of the car and its first US-based owner, Kent interviewed Frank Cerny via telephone on August 8, 1999. Now 77 years old, Frank has had a long association with Corvairs and an even longer one with rear-engined cars in general. His father owned several Tatras (mostly 77s and 87s) and Frank learned to drive in one, receiving his license in 1938. Frank learned how to back a Tatra 77 around a corner (into the family garage) after washing it at the tender age of 12. Frank moved to the US for the first time in 1952 and bought a classic American car—power steering, power brakes, automatic transmission. He was so disgusted with the way the car drove and handled that he vowed to never own a car of that type again. He missed feeling the close connection with the machine and road. In 1962, Frank landed a job that required living in Europe. He drove mostly company cars for awhile but eventually ordered a new Mercedes 230SL (after seeing one at the Frankfurt Auto Show) and picked it up at the factory. The engine blew with less than 6000 miles on the odometer and shortly thereafter Frank was transferred back to the US. Back in the States, Frank and his wife Christel moved to New York City and he purchased a '63 or '64 Corvair to get his feet wet. He had read Unsafe at Any Speed and concluded "What he [Ralph Nader] was condemning was what I wanted!" (a sporty car in the European tradition). Frank got along well with his first Corvair and ordered a '66 Corsa 140 convertible new. In approximately 1969-70 he was transferred back to Europe (to France then Belgium this time) and took the convertible with him. One day, while he and his wife were driving the convertible through Liege, Belgium, he saw another '66 Corvair parked. This, as you may have guessed, was the '66 Corsa coupe now owned by Eric. Frank located the woman who owned the car and heard an unfortunate story. The woman and her husband had bought the car together. They recently had been involved in a terrible motorcycle accident that killed the husband and permanently blinded the wife. She obviously had no use for the car any longer and sold it to Frank. At the time Frank bought the car, it had an aftermarket sunroof, which he later removed because it leaked when raining and made too much noise at Autobahn speeds. Markus, Frank's son, was born in Germany in 1973 and has many fond memories of growing up with the Corsa. This historic Corvair coupe has certainly had a very colorful existence!